A 24 inch octagonal horizontal dial probably made of marble. The dial is plain, with Roman numerals at the end of hour lines. The gnomon is a simple open triangle of well aged brass. The base is an octagonal pillar surrounded by flowers. The dial was struck by a falling tree in spring 2011. The gnomon style is broken and bent and the support has several large cracks. The falling tree also damaged the surrounding fence. A stainless steel and concrete vertical structure 33 feet tall. A stainless steel triangular tube, upright, with triangular and trapezoidal cut-outs, placed in the center of a concrete circle, with a sundial face but may not be functional. 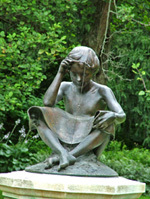 Bronze Sundial, Boy with Spider Gnomon wire is broken but present as of 2/2014. This brightly decorated analemmatic sundial is painted on the asphalt to look like a book turning into flowers, showing the combination of literacy and nature. The dial is approximately 10 foot wide with hour marks from 5am to 7pm with drawings of various flowers. Noon is marked with a large sunflower. The central walkway is simply done with the abbreviated names of the months, one column in green, the other in red. An 8 foot high equatorial dial of welded stainless steel with a brass gnomon and brass equatorial ring. The 60 inch diameter equatorial ring is engraved with hour marks and Roman numerals. 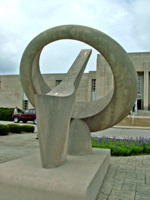 Dial was commissioned by the cities of Lafayette and West Lafayette in celebration of the Millennium. Dial sits atop a short concrete pedestal. Via Solaris, a 20x15x4 foot granite, stainless steel and bronze calendrical dial showing yearly equinoxes and summer solstice.